This image shows the impressive Newcastle townscape and its position at the lowest crossing-point of the River Tyne. Daniel Defoe visited Newcastle around 1720 and commented: "Newcastle is a spacious, extended, infinitely populous place; 'tis seated upon the River Tyne, which is here a noble, large and deep river and ships of any reasonable burthen may come safely up to the very town." Newcastle was one of the most impressive urban centres outside of London. Some of its fashionable classical-style public buildings stand out in this print. It was also a smoky, dirty industrial centre. 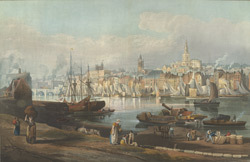 Shipbuilding and coal exporting were two important industries during the 18th and early-19th centuries, as can be seen in the busy port.